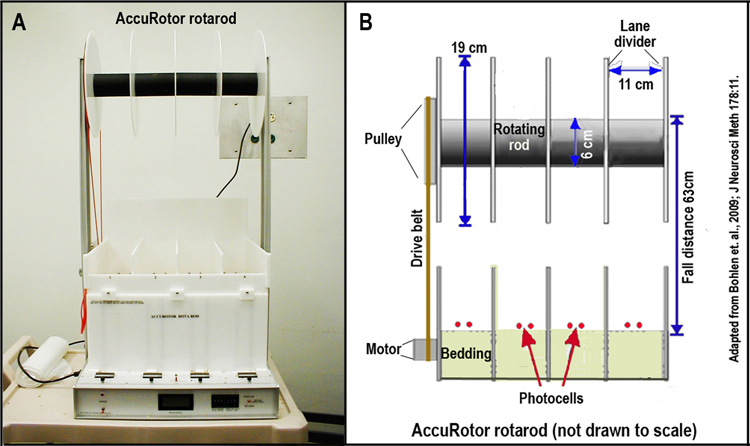 Rotarod: The AccuRotor Rota Rod (Accuscan Instruments, Columbus, OH) is used for both ARR and FSRR tests. The apparatus is modified with a 63-cm fall height, and dowel surfaces covered with 320 grit wet/dry sandpaper to provide a uniform surface and to reduce slipping. For the ARR, the apparatus is accelerated at a constant rate of 20–60 rpm/min starting at 0 rotation per min (rpm) and a maximum speed of 99.9 rpm. For the FSRR, the apparatus is rotated at 3, 6.5, or 10 rpm. Figure 1 A. Photograph image of the AccuRotor Rota Rod. Figure 1 B. Schematic illustration of the AccuRotor rotarod. a. The mice are first acclimated to their testing environment before they are subjected to two consecutive days of acquisition training on the ARR. b. After the mice are acclimated, a squad of four mice are positioned on the rotarod, starting at 0 rpm the rotarod is accelerated at a constant rate of 20 rpm/min. The duration of time the mice remained on the accelerating rod is marked automatically by the latency to fall off the accelerating rod. c. Each mouse is given 30-s inter trial interval (ITI) for 10 consecutive trials on the ARR. d. The following day, after the initial day of training, the mice are again subjected to 10 consecutive trials at 20 rpm/min. e. For the interlaboratory (Portland vs. Edmonton) reliability studies, different cohorts of mice are trained with only one day of 10 consecutive trials on the ARR at 20 rpm/min (see performance comparison between sites). a. After two days of training, mice are then given one trial on the rotarod at 20 rpm/min to reacquaint the mice with the apparatus, followed by 5 baseline trials, one each at 20, 30, 40, 50, and 60 rpm/min consecutively. b. After measuring baseline performances at five different accelerations rates, the mice are then randomly injected intraperitoneal (i.p.) with their first dose of ethanol (0, 1.0, 1.25, 1.5, 1.75, or 2.0 g/kg) and then placed in individual holding cages. c. 30 min post-ethanol injection, the mice are retested at 20, 30, 40, 50, and 60 rpm/min consecutively on the ARR. d. 48 h after receiving their first dose of ethanol, most of the mice are again randomly administered their second dose of ethanol (0, 2.0, 2.25, 2.5, 2.75, or 3.0 g/kg); mice that received 0 or 2.0 g/kg on their 1st dose of ethanol are given the same dose on their 2nd dose, and then placed in individual holding cages as before. e. As in #3 above, 30 min post-ethanol injection the mice are retested again at 20, 30, 40, 50, and 60 rpm/min consecutively on the ARR. f. For inter laboratory (Portland vs. Edmonton) reliability studies, the mice are given 1 day of training (10 trials) on the ARR at 20 rpm/min (see #5 of Training and acquisition (ARR) above). g. The following day mice in the inter laboratory reliability study groups are weighed and then subjected to three initial baseline trials on the ARR at 20 rpm/min. h. Immediately after measuring baseline performances, the mice are injected i.p. with saline and then returned to their individual holding cages. i. 30 min post-saline injection, the mice are subjected to three additional ARR tests at 20 rpm/min and then returned to their home cages. j. The following day, the mice are treated identically, except that each mouse is injected i.p. with 2.0 g/kg (20% vol/vol) ethanol. k. Immediately after the three baseline trials and 30 min post-ethnol injection, the mice are retested on the ARR at 20 rpm/min (see parameters trends comparison between sites). • Days 1 and 2 controls with vehicle solution i.p. • Day1 Tx w/ EtOH 1 g/kg body weight i.p. • Day1 Tx w/ EtOH 1.25 g/kg body weight i.p. • Day1 Tx w/ EtOH 1.5 g/kg body weight i.p. • Day1 Tx w/ EtOH 1.75 g/kg body weight i.p. • Day1 Tx w/ EtOH 2.0 g/kg body weight i.p. • Day2 Tx w/ EtOH 2 g/kg body weight i.p. • Day2 Tx w/ EtOH 2.25 g/kg body weight i.p. • Day2 Tx w/ EtOH 2.5 g/kg body weight i.p. • Day2 Tx w/ EtOH 2.75 g/kg body weight i.p. • Day2 Tx w/ EtOH 3.0 g/kg body weight i.p. a. Mice are tested for performance on the FSRR using parameters previously determined from other studies with genetically heterogeneous mice. b. Initially mice are given three practice trials on the rotarod at a fixed speed of 3 rpm, and with maximum duration of 30 s and an intertrial interval (ITI) 30 s.
c. Shortly after three practice trials, the mice are given a 3-min criterion test. The mice are "passed" when they succeed in "passing" the criterion test or if they have receive a maximum of 10 trials at 3 rpm in the FSRR. d. As soon as the mice passed the criterion test, the mice are injected with randomly chosen dose (1.0, 2.0, or 3.0 g/kg) of ethanol and immediately (T=0 or 0 min post-injection) placed back on the rotarod with a fixed speed of 3 rpm. Mice that are able to stay on rotarod for 3 min post-ethanol treatment are then returned to their home cages to recover for at least 72 h.
e. Three days after the initial test, mice are again given three practice trials on the rotarod at a fixed speed of 6.5 rpm, and with maximum duration of 30 s and an intertrial interval (ITI) 30 s.
f. Shortly after three practice trials, the mice are subjected to a 3-min criterion test as before. g. As soon as the mice passed the criterion test, the mice are injected with randomly chosen dose (1.0, 2.0, or 3.0 g/kg) of ethanol and placed back on the rotarod with a fixed speed of 6.5 rpm as before. Mice that are able to stay on rotarod for 3 min post-ethanol treatment are then returned to their home cages to recover for at least 72 h.
h. Three days after the last test, the mice are again given three practice trials on the rotarod at a fixed speed of 10 rpm, and with maximum duration of 30 s and an intertrial interval (ITI) 30 s.
i. Shortly after three practice trials, the mice are subjected to a 3-min criterion test as in the two previous tests. j. After the mice passed the criterion test, the mice are injected with randomly chosen dose (1.0, 2.0, or 3.0 g/kg) of ethanol placed back on the rotarod with a fixed speed of 10 rpm as before. Mice that are able to stay on rotarod for 3 min post-ethanol treatment are then returned to their home cages to recover for at least 72 h.
k. As in ARR, the duration of time the mice remained on the rod is marked automatically by the latency to fall off rod. Performances on the rod under various doses of ethanol and under each corresponding speed are subsequently analyzed for comparison between strains. Investigator's notes: "Pilot studies showed that 2.0 g/kg was too high a dose for the majority of mice to be able to perform 30 min later. If mice are able to stay on the rod for 3 min after ethanol, they are given a score of "pass" and taken off the rod." • Tx w/ EtOH 1 g/kg body weight i.p. • Tx w/ EtOH 2 g/kg body weight i.p. • Tx w/ EtOH 3 g/kg body weight i.p. Latencies to fall from an accelerating (20 rpm/min) rotarod under two days of training, baseline, and ethanol (2 g/kg) treatment conditions. Latencies to fall from an accelerating (20 rpm/min) rotarod following two days of 10 acquisition trials at two different sites (Portland and Edmonton) under baseline, and ethanol (2 g/kg) treatment conditions. Latencies to fall from a fixed-speed (6.5 rpm) rotarod under different doses (1, 2, and 3 g/kg) of ethanol immediately post injection. Criterion test: pre-treatment qualifying trial; if a mouse fail it is given additional training or practice up to a maximum of 10 trials.